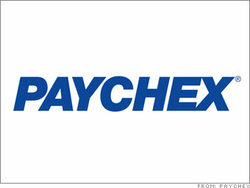 DividendMax»Company Coverage»Country:United States»Exchange:NASDAQ»Sector:Support Services»Company:Paychex Inc.
Paychex, is a leading US provider of payroll and human resource services for small to medium-sized businesses. The company’s recent acquisition of two major payroll processors, Advantage Payroll Services and InterPay, provided Paychex with more than 80,000 new clients. Founded in 1971, the company has more than 100 offices and serves more than 490,000 payroll clients across America.